Microsoft has revealed their third Lumia phone running on Windows 10 today, a budget flagship that the company says is great for business and productivity. 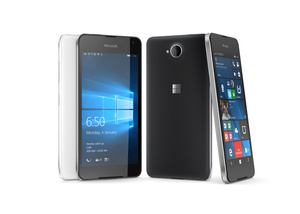 The new Lumia 650 costs just $199 unlocked and features a 720p 5-inch OLED screen, dual 8MP/5MP cameras and a mid-range quad-core Snapdragon 212 processor clocked at 1.3Ghz. The phone also has 1GB RAM, NFC, 16GB internal storage (microSD card expandable) and a 2000mAh battery. Microsoft says the device is built for productivity and is the "smart choice for your business." The software giant confirmed earlier this quarter that Windows 10 Mobile is an "ex-platform" as it has become abundantly clear that sales were nowhere near expected. That being said, Microsoft is still expected to release one final smartphone, a Surface Phone, to see if the mobile operating system has any shot in the market.